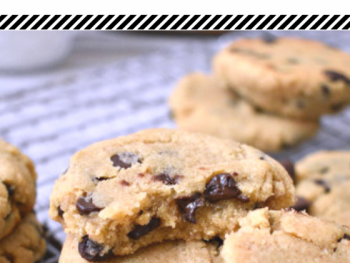 This post was created in partnership with Mrs. Renfro’s. I was not financially compensated for this post but did receive a sample for review purposes. As always, all opinions are entirely my own. Thank you for supporting the brands that support me! 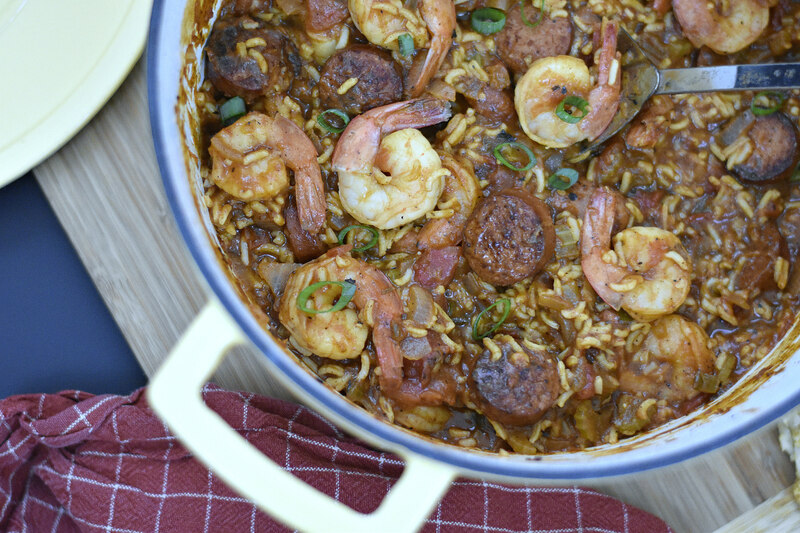 Whip up this extremely tasty jambalaya recipe featuring large shrimp, kielbasa sausage, and microwavable basmati rice. 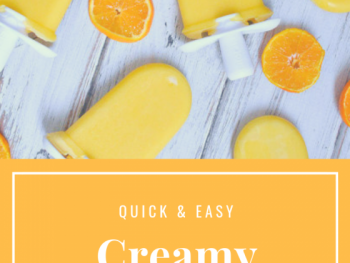 Everyone will love the bold, zesty flavors! Hey guys, you’re in for a treat! My grandfather was craving something a bit spicy with shrimp and jambalaya fit the bill. Plus it wasn’t Mexican food so that was a huge bonus for me. We always eat Mexican food — we love it but it’s nice to change things up every once in a while too! 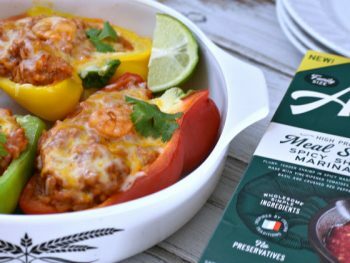 This recipe leans more toward the creole side than Cajun. Yes, these two words are actually two different styles of cooking. Shocking, right? 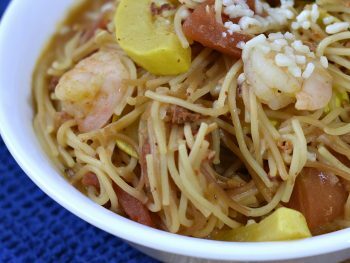 For this recipe, this means the addition of tomatoes which typically isn’t in a cajun jambalaya recipe. I love me a good tomato. 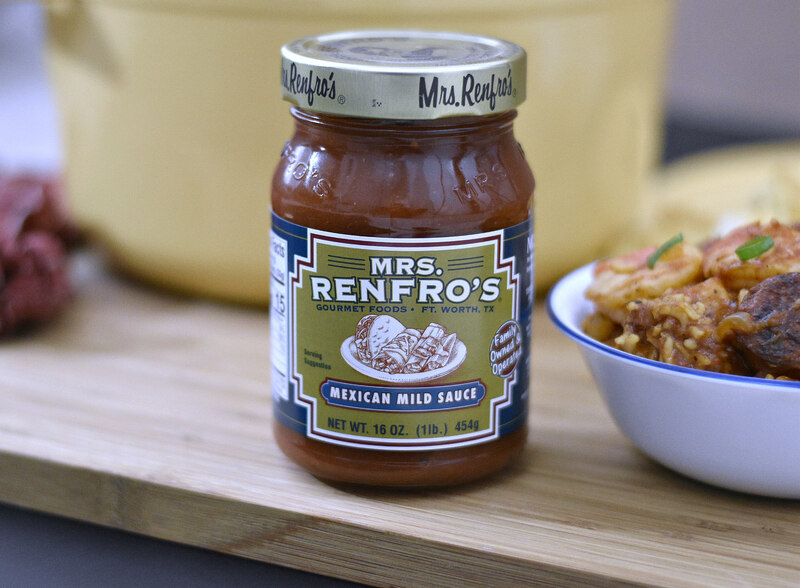 We included a can of fire roasted tomatoes and a jar of Mrs. Renfro’s salsa. If you haven’t used Mrs. Renfro’s you’re missing out! 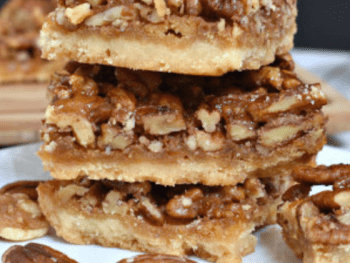 Renfro Foods is a Texas-based company that has been in business for a long time. They make more than 30 salsas, peppers, relishes, and sauces, which are available in all 50 states, as well as in Canada, the Caribbean, England, Scotland, Germany, Spain, and Australia. Adding a jar of salsa added way more flavor than using just another can of diced tomatoes. I used a mild salsa but feel free to use another flavor – Mrs. Renfros offers SO many! Also, we didn’t use chicken in this recipe but you are welcome to add it if you want. I just added sausage and shrimp because chicken gets boring to me sometimes. Am I right? And, kielbasa sausage at that. Typically, you hear of people using andouille sausage but I prefer kielbasa. I say go with whatever smoked sausage you like most! 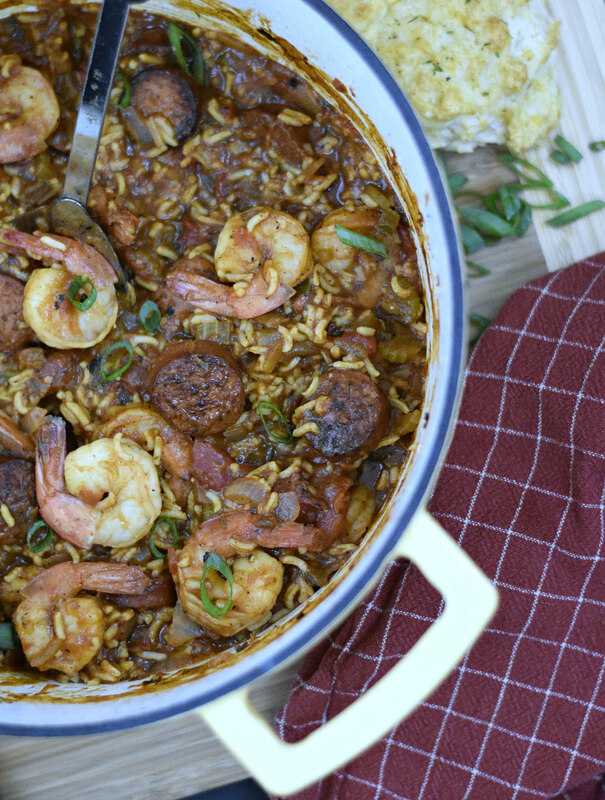 To make this jambalaya recipe I used a dutch oven. Essentially, it’s just a really heavy pot with a tight lid. The walls are nice and thick and it can withstand pretty much any amount of heat you throw at it. They are great for making soups, stews, and braising things like my beer braised brisket. 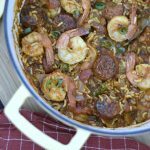 While this jambalaya recipe isn’t a soup or stew you can certainly turn it into one by just adding some chicken broth! In a dutch oven heat the oil over medium-high heat. Add sausage; constantly stir until browned on all sides, about 6-8 minutes. Remove and set aside. Add celery, onion, garlic, and all spices and cook 3-5 minutes over medium-high heat until tender. Stir in tomatoes, salsa, shrimp, sausage, pepper sauce, and Worcestershire. Bring mixture to a boil, reduce heat to medium, and let simmer for 5-8 minutes covered. Stir in rice and let simmer a few minutes more or until rice is warmed. 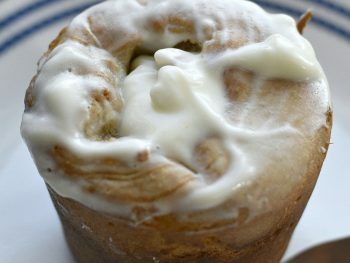 Serve with cornbread if desired. Enjoy! What’s favorite creole or cajun recipe? 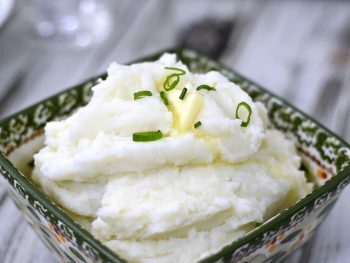 A Super Easy Real Potatoes Side Dish for Crazy Weeknights – On Demand! 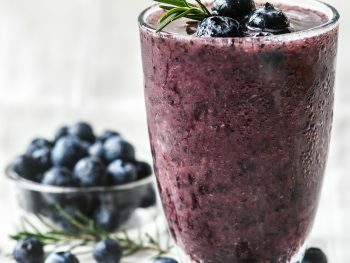 That looks really good. I need to invest in a good dutch oven. 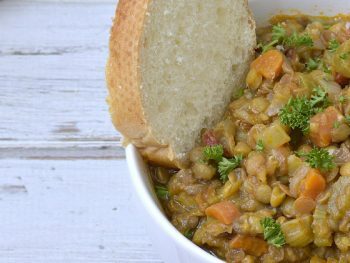 They are good to have around especially if you enjoy soups a lot. Or braising meat! I love Mrs. Renfro’s salsas. 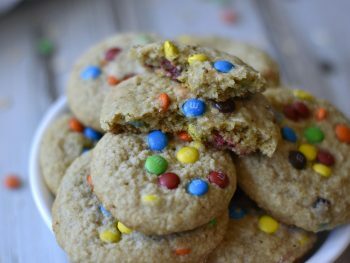 This recipe looks so delicious, too. Pinning this! Give it a try, Sara. 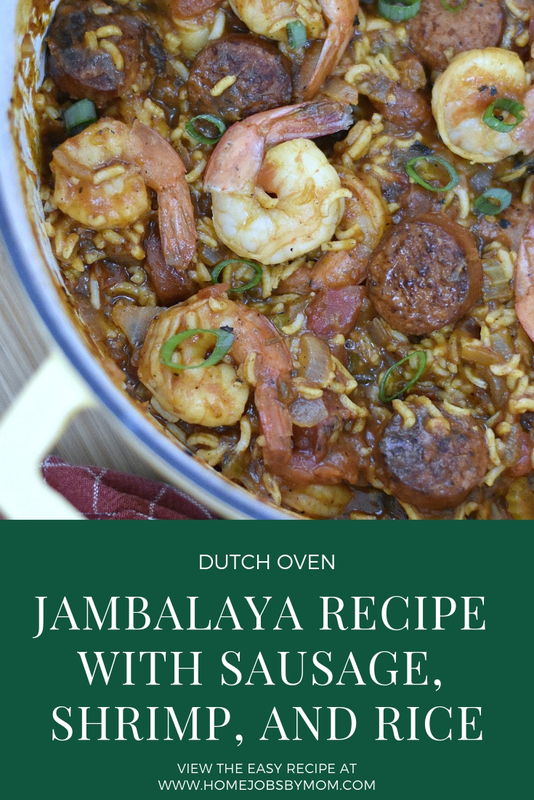 Hope you enjoy this jambalaya recipe! I love jambalaya and most Cajun foods. It is really comforting during this cold season. 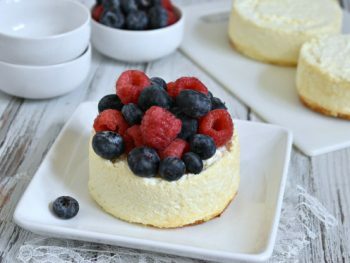 This recipe looks delicious. Thanks, Amy! It is great for this weather! !